Winterfest has been a long time tradition at the imago school. For as long as anyone can remember the week before winter break has been packed with fun and games and a certain amount of silliness. There is something to suit everyone with a different activity every day; no one gets bored. This year throughout the week before winter break we did a variety of different things from ice-skating to funky arts and crafts and an entertaining movie to wrap up the week. There was also the annual Imago Olympic Games near the beginning of the week, where the whole school participated in a mega relay race with seven different activities. On Tuesday afternoon arts and crafts were held individually in each classroom. Each parent volunteer tought and desiigned the craft for the specified class. Some classes made delicate jewelry hearts while others made funky marshmallow guns. 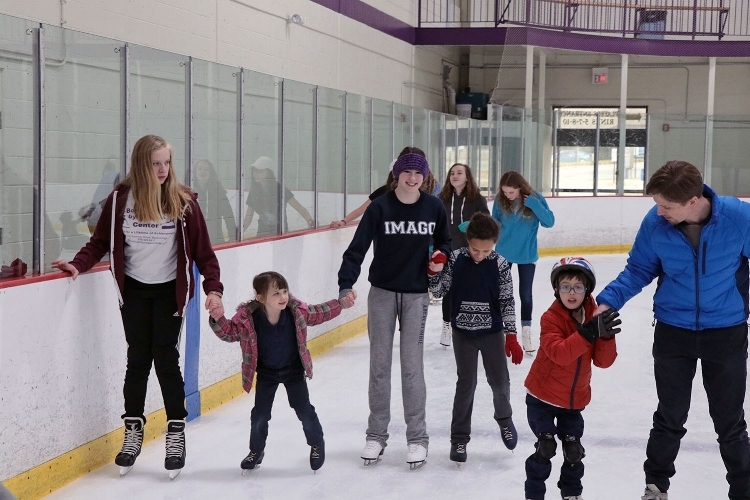 Everyone had fun during the ice skating event on Wednesday, whether it was their first time on the ice or they were doing spins, it was enjoyable for everyone! Some people were playing ball and whizzing around the ice while others were helping the little ones around. The Winter fest Olympics were held on Monday this year, they consisted of five teams that each contained twelve students and a teacher. All the teacher's names were jumbled around for to make it fun For example Mrs. McKee was changed to Mrs monkey! The teacher's name usually influenced the team name as well, Mrs. McKee's team were named the ferocious monkeys! Each team divided the roles needed to complete the race. There were quite a few but the two most difficult were the backward basketball and eating fluff and crackers whilst whistling. The winning team had a big advantage when Ben put their basketball in backwards on the first try! Everyone else was struggling with that activity. Even the losing team had fun as the event ended with everyone eating chicken with waffles and maple syrup, a Southern treat introduced by our new Headmaster, Mr. Burbeck! To finish the week, the first through sixth grade watched a film with freshly popped popcorn and drinks while the seventh and eighth grade went bowling in Acton at the Bowladrome. Both are excellent ways to wrap up a fun week before vacation starts. Welcome to the 1400s, the age of knights and castles. Today we are the honoured guests of King James and Queen Olivia and a small medieval feast. Meanwhile, in a parallel dimension, the 6th grade class at the Imago School is presenting reports on the Middle Ages. While eight select members of King James’ kingdom and Cardinal William were dressed in their finest to attend a feast in the great hall of the king’s castle, two of the 21st century 6th graders, Nichole and Victoria, gave their history presentations. Nichole began, with a detailed report on her favourite subject, horses. Her report was specifically on the Medieval war horse, which is now believed to be extinct. Victoria’s report was on King Charlemagne. Back in the great hall, the servants had just served the first course of bread and cheese. A few minutes before, a Latin prayer had been recited for the eight guests, the cardinal, the king and the queen. After a small break, the second course of delicious cinnamon and chicken soup and stewed beef was served. Naturally, this was eaten in the same bowl as last time. The other course’s leftovers were dumped into the slop bucket for the peasants and dogs. One of the guests, Lady Jazmyn, came forward during an intermission and explained the history of drama, her favourite subject. She also asked everyone to join her in a play. They were to perform the story of Saint George. 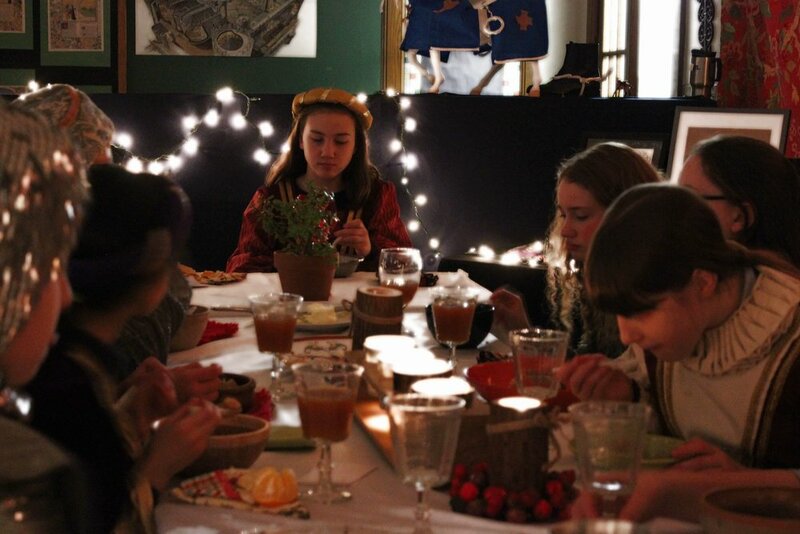 All of the people at the feast took part, using the space in the upper floor of the castle. It was entertaining, according to an onlooker. Meanwhile, in 6th grade, Jazmyn had just finished her report. Olivia, who had gone a short while before, gave information on stained glass and its uses. Jazmyn, however, presented her study on medieval drama. After a mock Medieval-style play on the upper floor of their school, it was Grace’s turn. She nervously gave her report on the rough life Medieval people led in a castle. Her report was followed by Josabeth, who had used her amazing calligraphy and art skills to make an illuminated manuscript all by herself. Naturally, her detail made it appear as if she had printed a picture. Joe came next, enlightening the class on the siege weapon, specifically the trebuchet. At noon, Sir Joseph sent for his father, who arrived from another kingdom, bringing a trebuchet about six feet high. 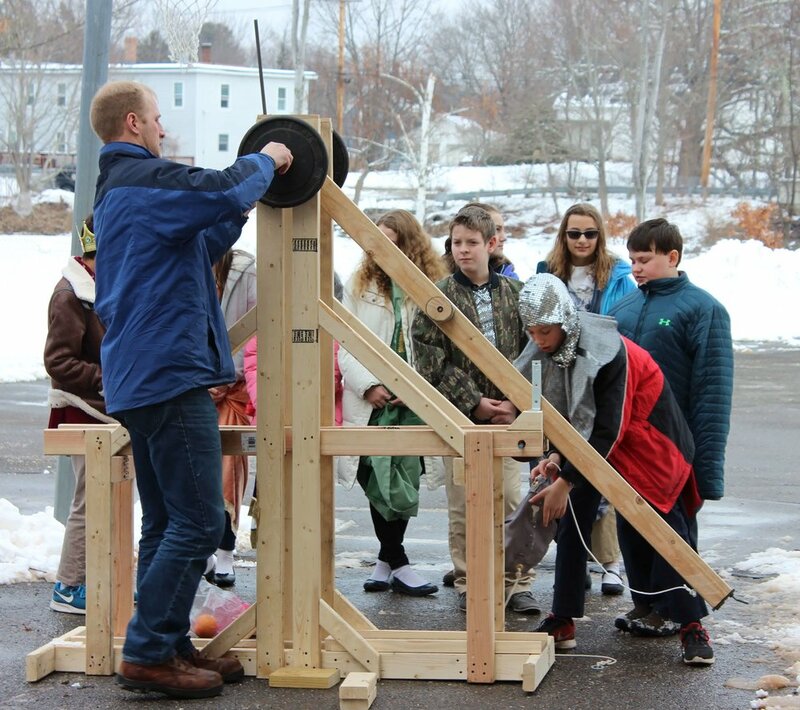 Unfortunately, Sir Joseph’s hand-built trebuchet backfired, literally! The fruits put into the trebuchet rolled backwards out of the sling when it was released. This was because the trebuchet’s sling was too big. Sadly, even after making these corrections, only one fruit flew. The arm that shot the fruit cracked, so Sir Joseph’s father stayed to fix it while the feast-goers returned to the great hall through the minimal amounts of slush and grit. The main course of meat pies, meat balls, quiche, and spinach quiche was served shortly after this tragic accident. It was quite delicious, especially the meat pie, which the only female hunter, Nichole, and her family both hunted and prepared. The spinach quiche, made by Victoria, was unfortunately not as enjoyed by King James and Queen Olivia. After the main course, a singer was brought in all the way from the land of Austria. The singer, being fluent in Latin, sang a Latin/German song. After this he went home. A knight, by the name of Sir Josiah, stepped up next to the podium. He was here for an important meeting in defence of a castle. Sir Josiah first explained the defence and siege for the people who didn’t understand it (all of them) and then presented a model castle. In a few minutes, dessert was served. There were pies and a lemon tart, too. All of the dessert was well enjoyed. Then the feast was over. The great hall was empty, slowly fading away in the sands of time. Six hundred years later, the 6th grade created this Medieval scene. The great hall is still there, you see, if you believe. Our annual Lessons and Carols service, Dec 15, 2016, was terrific. Here is the video. Come visit the Imago School this week on Wednesday July 13 from 6-8pm. Tour the School, meet Staff, and see what The Imago School has to offer your family. Find us in the St. Bridget's School at 1 Percival St, Maynard MA. Join us on Thursday, January 28th from 9am-noon to see our classrooms in action, check out what a day in the life of an Imago student looks like and ask staff your questions! Childcare available for the morning session. Can’t make it during the day? No problem! Visit us between 6-8pm on Thursday the 28th or between 2-4pm on Sunday the 31st! Join us Thursday, December 17, 2015 at Trinity Church in Bolton for another year of terrific music and recitations. Visit our classrooms in session this Thursday, November 5 from 9-Noon to see what makes Imago wonderful and unique. Additionally, we will be holding evening and weekend hours on Thursday the 5th from 6-8pm as well as Sunday, November 8 from 2-4pm. All of our Open House hours will be staffed with tour guides and administrators able to answer your questions and provide information about our programs. For more information please feel free to call the School at 978-897-0549. In addition to our hysterical obstacle course complete with grass sledding, we had wonderful food (30 pounds of BBQ brisket!) and more hamburgers, hot dogs, salad, cookies and chips than we could eat! This was such a great time together- we are already looking forward to next year!